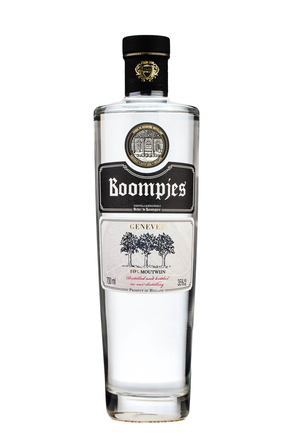 Genever, also known as jenever, jeneva, geneva and hollands, is a juniper-flavoured spirit from Holland and Belgium. Like gin, juniper is an obligatory ingredient for genever but in general, genevers contain less juniper than gin. Genever is a very distinctive style of juniper spirit and is the forerunner to the London dry gin style which dominates today. 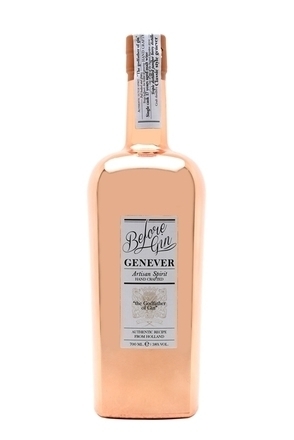 Unlike most gins, genever it is a blend of two very different spirits - botanical-infused neutral spirit and malt-wine, a kind of unaged whisk(e)y. Genever retains more of the flavour of its base ingredients - rye, malted barley and maize - than most common gin styles, which are based on neutral spirit alone. 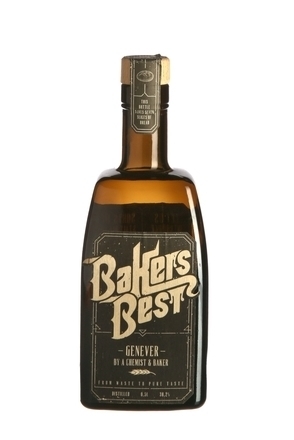 Indeed, genever can be described as a cross between a whisk(e)y and gin. In its homeland, the low countries of Europe, genever is often sold with fruit flavouring, such as orange or lemon. Confusingly, there are numerous words and alternative spellings for genever, including: jenever, jeneva, geneva and hollands. Helpfully, the van Dale Dictionary (the Dutch equivalent to the Oxford English Dictionary) lists the first known published use of the word 'genever' (spelt with a 'g') in 1672. 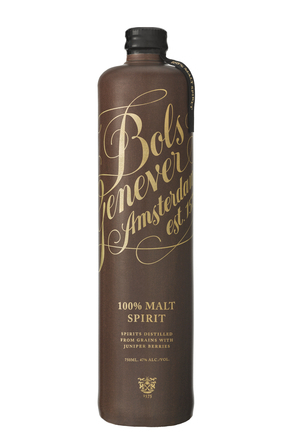 And since Bols started promoting its genever to export markets in 2008, other producers have chosen to move from jenever with a 'j' to genever with a 'g' - certainly for export markets, to the extent that genever is now the prevalent spelling. The word jenever comes from Junipérus Communis, the Latin name for juniper berries. The other spellings stem from the French word for juniper being 'genièvre' while the Dutch word is 'jineverbes'. Hollands is an English/American term for genever. As stated above, genever is a blend of two different spirits. The first spirit, moutwijn (malt-wine), is what gives genever its distinctive flavour. This is a kind of unaged whisk(e)y (40-80% alc./vol.) made by triple and sometimes quadruple pot-distilling a mixture of cereals, typically rye, corn and wheat with malted barley less commonly used. After the final distillation, the malt-wine leaves the pot still at around 47% alc./vol. : a relatively low distillation strength which yields a spirit that retains more of the malty flavours of its base ingredients. 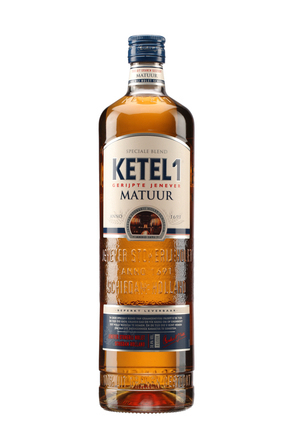 The first distillation is called 'ruwnat', the second 'enkelnat', the third 'bestnat' (actually malt wine) and the optional fourth distillation 'korenijn'. The second ingredient that comprises genever is produced in a very similar way to most London dry gins. Neutral spirit (basically very high strength vodka) made from either grain (often wheat) or sugar beet is redistilled with a recipe of botanical flavourings. Juniper berries are the key botanical in genever, although quantities vary tremendously between distillers with juniper sometimes the only botanical. Other botanicals, as many as ten, are usually added, particularly in the Netherlands where more botanicals tend to be used - most typically coriander, angelica, caraway, orris and liquorice. These botanicals can be distilled with neutral alcohol or with malt wine. These botanicals are also commonly found in gin but genevers tend to have a flavour profile that's very different from most London dry gins, although genever is essentially a gin. Like gin, genever must contain juniper, but unlike gin juniper does not have to be the predominant flavour, or indeed even noticeable in the finished genever. One other striking difference between the botanicals used in gin versus genever is the lack of citrus fruit in genever. Like so called "bath tub" gin, some producers of poor quality genever also use add juniper flavour or oil, without distilling or macerating it. Finally, the two spirits are blended together. The percentage of malt wine used varies according to the style of genever being made: see below. Originally and until the end of the 1800s, genever was malt wine. 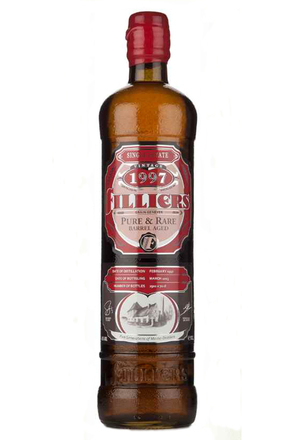 The addition of the flavoured spirit to 'stretch' the malt-wine only came about after the invention of the continuous still led to the production of quality, clean neutral spirits. If genever is to benefit from aging in oak casks, then the malt wine and flavoured natural spirits may be aged separately and blended prior to bottling. There are three basic styles of genever - jonge (young), oude (old) and korenwijn (grain wine). They differ in their use of botanicals and the percentage of malt-wine contained. Originally, all genevers were based on malt wine made in a pot still, but with the invention of the column still (which makes neutral alcohol) so genever started changing. Today, the alcohol base is an important factor in defining the category of genever. Genevers must be a minimum of 30% alc./vol. but if labelled as 'jonge' or 'oude', then a minimum 35% alc./vol. is required. 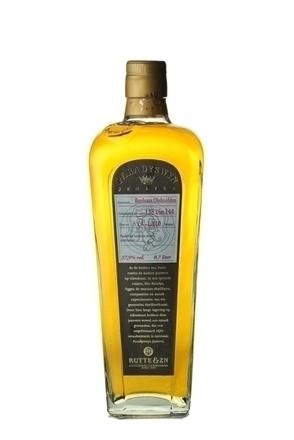 The term graanjenever distinguishes the type of base alcohol used. 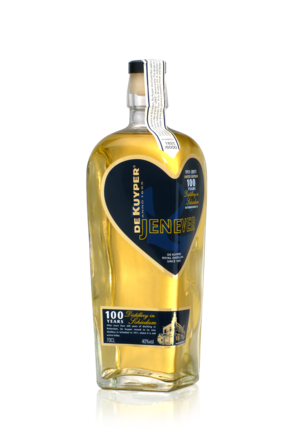 Genever can only be labelled graanjenever if the alcohol is 100% from grain - either pure grain alcohol and/or malt wine. 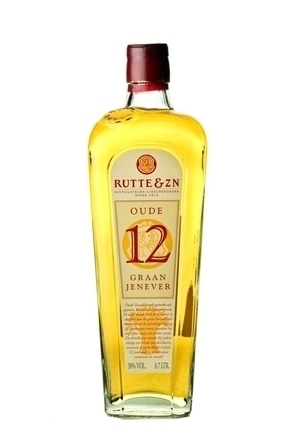 Jonge and oude jenevers can be graanjenever. So named because it is a modern/young style, jonge genever is a clear spirit without colour whih was first developed in the 1950s in response to the rise of vodka and consumer demand for a lighter flavoured, more mixable genever. 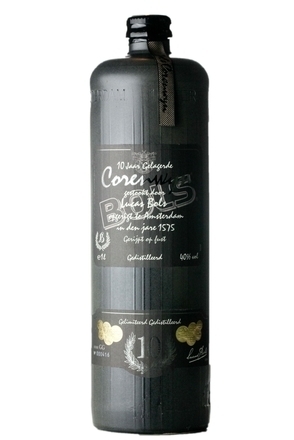 Jonge genevers contain a lower percentage of malt-wine than either oude or korenwijn styles, typically only about 5%. Some presently have no malt-wine but there's an agreement to make a minimum of 1.5% malt-wine an obligatory ingredient in all genevers. Jonge genevers generally have fewer botanicals as well: in some brands, the juniper is barely detectable. • Contain no more than 15% malt wine. • Be at least 35% alcohol by volume. • Contain a maximum of 10 grams of sugar per litre. • If the label states 'graangenever' or 'grain jenever' then the neutral spirits used must be 100% grain based. Despite the name, oude genevers do not have to be aged but they tend to be golden with caramel colouring permitted. They are so called oude due to their being older, more traditional in style, as opposed to jonge genevers, which are modern. (Comparable to an old tom gin referring to an old style of gin.) Oude genevers usually have more botanicals than jonge genevers. Proportions and recipes vary from one brand to another, and different brands have very different characters, but aromatic botanicals like aloe and myrrh are often used to flavour oude genevers. • Contain at least 15% malt-wine. • Contain a maximum of 20 grams of sugar per litre. • Oude genever do not have to be aged but if a label mentions aging, then the genever must have been aged for at least one year in a barrel of 700 litres or less. Most distillers have a range of different types of genevers which include several aged genevers. Aged genevers are aged oude genevers. Jonge genevers are not aged. Although not an official category, malt wine genevers contain up to 100% malt wine and are the most authentic style of genever, as all genevers were originally 100% malt wine. Not all moutwijns are 100% malt wine and the use of high percentages of malt wine leaves less room for the botanicals. Korenwijn (which Bols spell 'corenwyn') often gets confused with genever, as it's also grain spirit from the Netherlands. However, it's not officially a genever nor recognised by the AOC. Korenwijn doesn't have to contain juniper or indeed any botanicals but they sometimes do. Korenwijn is often aged but it doesn't have to be. • Be at least 38% alc./vol. The initials ZO stand for the Dutch 'Zeer Oude', or 'very old'. They have no precise implication but suggests the genever is straw-coloured and slightly sweeter than jonge. 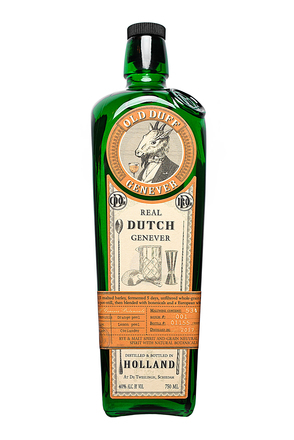 Likewise 'Extra Oude' has no legal classification but is often used to emphasise that a genever has been aged. As the term would suggest these are fruit flavoured genevers. They are a modern phenomenon gaining in popularity since WWII. Fruit genevers tend to emphasise the fruit with little malt wine or botanical character discernible. Where does genever come from? Since 2008, the production of genever is limited to the countries which form the AOC (appellation d'origine controlee) controlled designation of origin: The Netherlands, Belgium, North of France (Nord and Pas-de-Calais) and North West of Germany (Nordrhein-Westfalen and Niedersachsen). Dutch genever production traditionally centres on the town of Schiedham, near Rotterdam while in Belgium, it is produced mainly around the towns of Hasselt and Ghent. The Dutch and Belgians traditionally serve genever neat in tall 35ml (1.2 oz) capacity tulip-shaped glasses filled to the brim. Historically this tended to be at room temperature but now jenever (particularly jonge jenever) is served chilled, either from a refrigerator or even a freezer, in similarly cooled glasses. 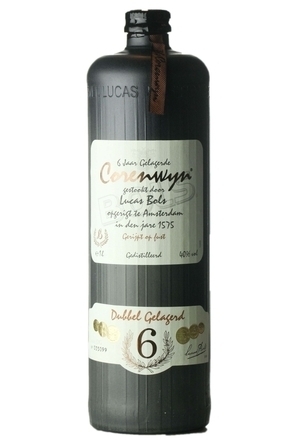 Historically, genever was also served with sugar and a small spoon with which to stir it but this is now rarely seen. Place a tall chilled tulip-shaped glass on the bar counter. Fill to the brim with chilled genever. The drinker then bends over the glass and takes the first sip without touching the glass. Then takes a sip of cold beer (lifting glass to mouth with hands) . Further sips of genever (now lifting glass to mouth) are followed by larger sips of beer. Continue until both glasses are emptied then consider the merits of starting again at step one. Jonge genever may be mixed with tonic, soda or cola in a similar fashion to vodka. The proportion of juniper in some brands is so low that even those who do not enjoy the taste of London dry gin may savour a jonge genever and tonic. Some people mix genever with bitters. Splash a few drops of bitters in an old-fashioned glass, rotate the glass to coat, then top up with cold genever and ice. This makes a drink not dissimilar in style to the British pink gin. Of course genever is also a versatile cocktail ingredient ans we've 50 genever cocktail recipes on Difford's Guide.